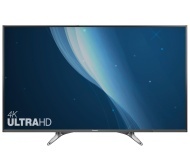 alaTest has collected and analyzed 19 reviews of Panasonic TX-55DX600B. The average rating for this product is 4.8/5, compared to an average rating of 4.6/5 for other products in the same category for all reviews. Comments about the design and price are generally positive. The sound and image quality also get good feedback. There are some mixed comments about the remote control. We analyzed user and expert ratings, product age and more factors. Compared to other products in the same category the Panasonic TX-55DX600B is awarded an overall alaScore™ of 89/100 = Very good quality. Panasonic as always 1st class. Fantastic picture quality, purchased a sound bar(Panasonic) as well other supplier. So easy to install! Great service from Richer sounds . Now our second Panasonic TV from them. All at a good price. Superb TV, almost as good as the sales staff. Panasonic TX55DX600B Value for money. Apps and Netflix. Intuitive remote set (much better than Sony). Can't use existing scary for the DVD player. Will have to buy new connector.